Our village of SOWERBY is one of the oldest in Yorkshire - recorded in the Domesday Book - with a long and interesting history. Sowerby was the birthplace of the Archbishop of Canterbury, John Tillotson (1630-94), as well as being the centre of a thriving early textile industry. Battles in the Civil War were fought nearby. In fact, three members of the Horton Family of Sowerby Hall were signatories of the execution order for Charles I! The area must have been a hotbed of parliamentary intrigue! Many of our 17th century houses, such as Sowerby Hall, are grade 2 listed and are fine examples of the architecture of the period. Our village Church, St Peter's, built in 1766, is grade 1 listed. Today, the area is a credit to the residents with their well-maintained homes and gardens, and most take a keen interest in the appearance of their village. 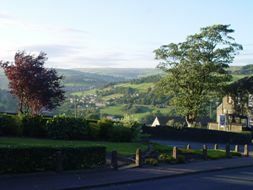 The village set on the side of the hill to the west of Sowerby Bridge, about 4 miles west-southwest of Halifax and 8 miles west-northwest of Huddersfield, with fine views over the Calder valley. Jean Illingworth's latest book, Sowerby Tales, is now available from bookshops.